In the heart of Decatur’s Oakhurst neighborhood sits a historic building, dating back to 1919. Once the old Scottish Rite Hospital for Crippled Children, designed by local architect Neel Reid, its southern exposure and many windows once provided ample sunshine to the children healing there. The hospital moved north in the 70s and eventually merged into Children’s Healthcare of Atlanta, but the historic building remains. Now, it’s home to Oakhurst’s hottest new eatery: Scout. Ed Seiber, whose firm redesigned the 4,500 square foot space, says his primary goal was to reveal the existing components of Reid’s original design: steel and wood trusses, vintage clerestory windows, high vaulted ceilings. Seiber opened up the interior space and added an elevated patio among the trees as well as a game room, a fire pit and a bocce court. No value assignedScout’s logo features a guiding compass topped by a coiled snake and two arrows crossed — the symbol of friendship. This makes sense, as the restaurant’s founders have been good friends since they worked together at Proof and Provision and the Georgian Terrace. Managing partner Chris Martha, executive chef Michael Semancik and beverage director Nate Shuman hope Scout will serve as a cozy new neighborhood gathering place for friends and families alike, named for the loyalty and brotherhood of organized scouting. Kids are welcome. There is a sort of alfresco mountain vibe going on with both Scout’s branding and food. “It harkens back to simpler times of youth,” says Semancik. Servers are casual in jeans, denim shirts and raw cotton aprons. The menu, divided into snacks, sandwiches, sides, “from the pantry,” and entrees, is perfect for sharing family style. Snacks are the most fun and flavorful to explore. Cherry wood smoked chicken wings ($8) are crisp whoppers imbued with smoke right through to the moist interior. Mussels ($11) from Maine’s Casco Bay come piled high in a broth wafting with aromas of garlic, spicy Louisiana andouille, and caper butter, later to be sopped up with a hunk of crusty bread. Six or so plump and lightly breaded and fried oysters with chunks of smoky bacon and baby greens lay atop toast as angels on horseback ($10). The clam roll is a real value at $6, similar in size to the famed version at Ticonderoga Club. A mountain of fried clams sprinkled with lemon and drizzled with house-made tartar sauce arrives on a speckled blue Steelite plate — a chic version of traditional camping cookware. No value assignedFrom the pantry, the Georgia greens salad ($8) comes lightly dressed in lemon vinaigrette with “seasonal tree fruit” (this time pear) and pecan brittle. It’s rather perfect in its simplicity with a lovely balance of texture and flavor. The chicken thigh Parmesan sandwich ($12) is homey and filling with peppery arugula, tangy Taleggio and tomato sauce. Entrees are huge and range from $18-$28. There’s fish, pasta and steak — something for everyone. Pan seared Maine scallops over creamy Gouda grits and turnip greens proved a well-executed combination of the chef’s roots: New England seashore meets classic Southern fare. The five-hour hanger steak arrived as ordered, medium rare with a crackly seared crust. Spicy hand cut fries topped with a blue cheese aioli sidled up next to tender sliced meat swimming in brown gravy. The gravy and cherry tomato garnish seemed unnecessary to me, but other diners really dug it. Vegetarians get love too with a surprisingly rich dish of ricotta and collard green dumplings (to note: the texture is more like falafel than dumpling) with sautéed kale over a thick pool of smoked yellow tomato marinara. No value assignedBeverage manager Nate Shuman wants his marble-topped, multi-sided bar to be a neighborhood hangout, “creative and playful with flavor pairings.” He achieves this with cocktails ($10-13) like the Tiki-inspired Nose Bone with dark rum, falernum, honey, lime, balsamic vinegar, and spices, and the Mi amor es de Coyoacán, which comes with a toasted marshmallow. His on-tap Nitro Toronto is a boozy mix of rye, Fernet Branca Menta, Tropicalia, and his own blend of bitters. Also on tap: six draft beers, all local. The wine list is a collaboration between Shuman and Martha: Old World and California and nearly 20 options by the glass. Shuman’s creativity extends to the weefolk as well; we saw a mocktail with burnt pineapple and a pineapple leaf garnish in the hand of one seriously happy camper. Meals end with a cute camping-themed mad libs comment card that arrives with the check, but first, if you have room, dessert. 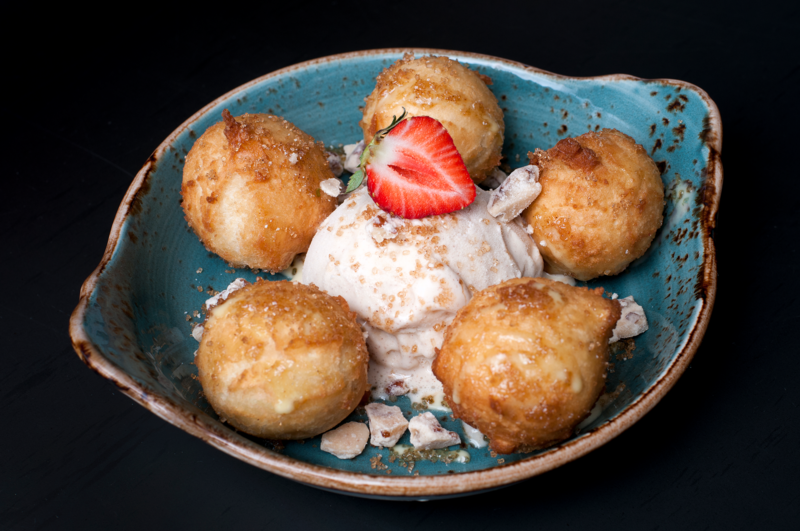 The bourbon sugar doughnut holes with pecan praline and vanilla bean ice cream ($7) are rustic but slightly elegant, with attention to presentation and ingredients. And that’s what Scout is, too: playful, decadent fun for the whole family. 321 W. Hill St., Decatur. 404-496-6863. www.scoutoakhurst.com.